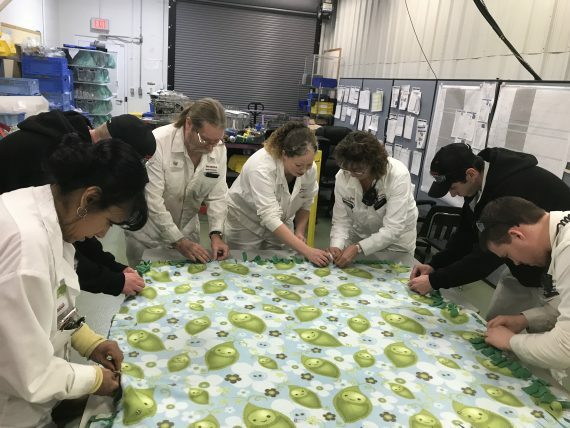 Some Honda associates took a break from assembling transmissions to assemble blankets for children staying at the Ronald McDonald House in Columbus recently. 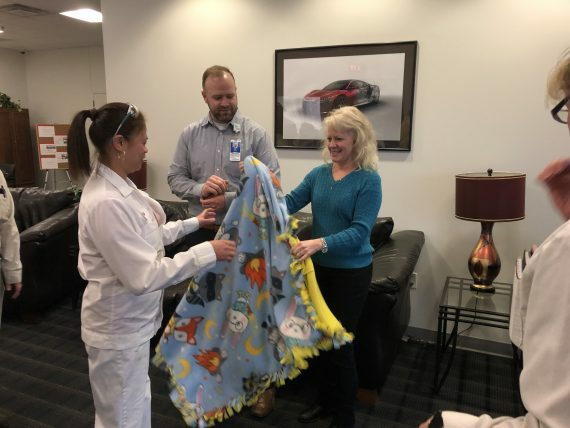 Stime Davis, an assembly line manager at Honda Transmission Manufacturing Inc. (HTM) initiated the project and enlisted her co-workers to help, after hearing a recent presentation at Honda by Dr. Kevin Klingele, Chief of Orthopedic Surgery at Nationwide Children’s Hospital. Davis organized the project as a team-building activity during the holiday luncheon for the assembly department. In all, 451 workers, including two shifts from four assembly lines participated. “Our assembly associates loved the idea of being a part of something to donate,” said Davis. 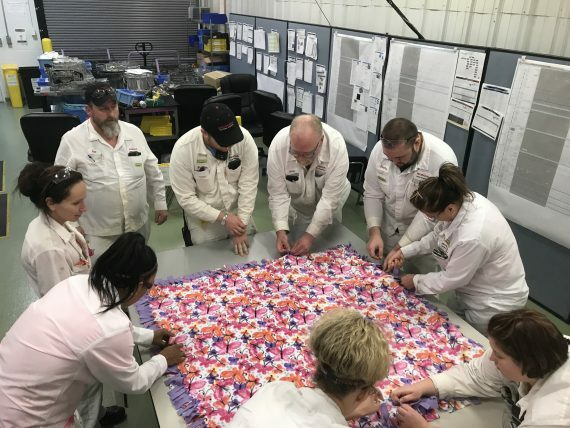 “It made us feel really good!” Associates were able to make 50 blankets, which staff from Nationwide Children’s Hospital picked up last week at HTM’s Russell’s Point plant. 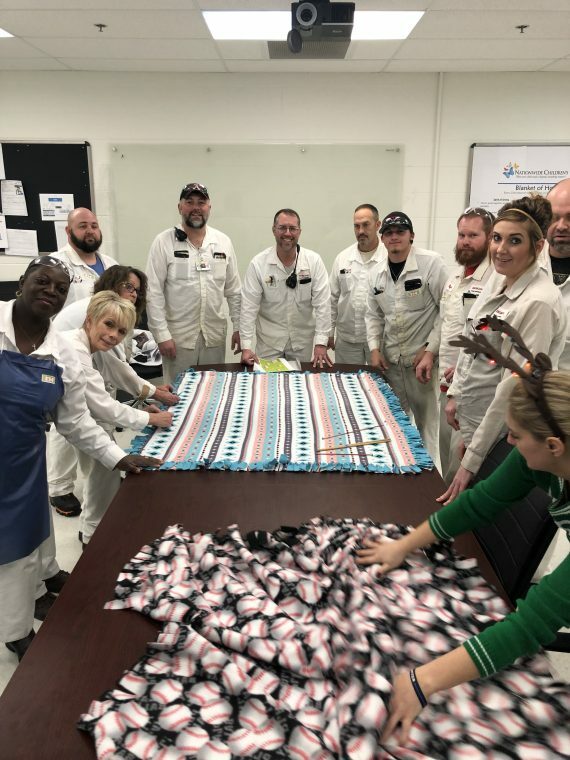 “This was such an amazing gesture, that we are all deeply touched,” said Teaya Rough, of Nationwide Children’s Hospital. With 137 rooms, the Columbus Ronald McDonald House is the largest in the world. Every night, hundreds of moms, dads, brothers, and sisters stay in the house, only steps away from Nationwide Children’s Hospital. The house provides a bit of stability in the midst of challenging times. Families can make the house the Ronald McDonald house their home-away-from-home for as long as their child is being treated in the hospital.